A volcano about ready to erupt is a repeated symbol that appeared in my dreams before and after I had a kundalini release. It is not surprising that this symbol should show itself, given the power of a volcano to release energy deep from within the earth, spew content up to the heavens and have it rain down on everything. When kundalini is released it is often experienced as very strong energy erupting into consciousness through the pathway of the spine, going to the head and then descending to the rest of the body. In my case, after the initial rising of the energy, I generally experience kundalini as descending or falling from my head. The whole body becomes animated as the energy surges through it. Blocks to the flow of this energy within the body can cause uncomfortable and even painful sensations and unusual physical reactions such as itching, twitching or for some people, temporary paralysis. Bearing in mind that dreaming of a volcano can mean many things, one has to ask what is going on—what energy is ready to explode in the life of the dreamer—that is manifesting such a power-laden dream. It could be long repressed anger or some other strong feeling. Or it could be some outside energy ready to explode such as growing quarrel between two people or it could even represent a real live volcano ready to erupt. Only the dreamer can know. I am in Hawaii. In the distance a volcano is sending up smoke and gas into the air. I am glad I don’t live near it. We have to go indoors as pieces of ash fall from the skies. Because I live in Hawaii where there is an active volcano, I interpreted this dream to refer to my awareness of the periodic spewing of Kilauea crater that emits volcanic ash called vog. I was genuinely glad I didn’t live immediately downwind from the volcano since the vog puts a big coating of dust on everything and exacerbates respiratory problems. However, I also understood that the dream was making me aware of my feelings about handling the kundalini energy. The dream was reminding me that while the kundalini effects were suppressed by the medications, the energy was still there sending a bit of smoke and gas. Being glad that I didn’t live near the volcano told me I wasn’t ready to go off the meds. Going indoors meant retreating to the use of drugs to avoid serious effects that might “fall from the skies.” As a result, I did not try to go off the meds then. Eventually, I reached the point where I felt comfortable going off the drugs and successfully did so. NOTE: My website, http://www.healingdreamgarden.com is undergoing changes so it temporarily unavailable. 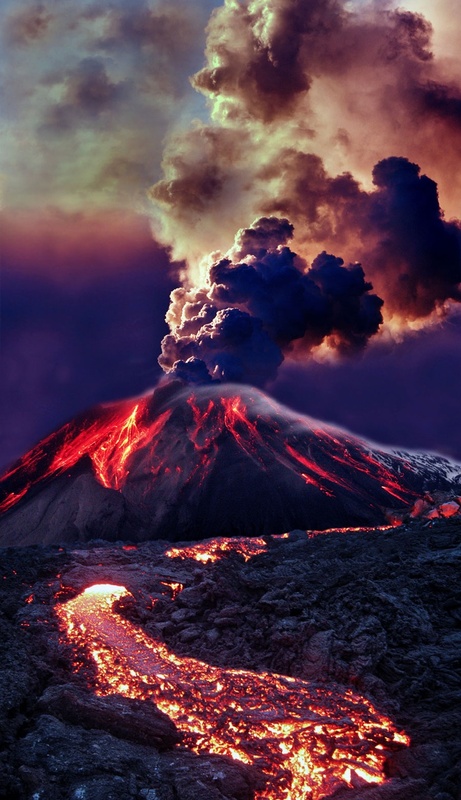 This entry was posted in Dreamwork Methods, Kundalini in Dreams, On Dreams, Uncategorized and tagged dreams, Energy, forecasting kundalini in dreams, kundalini, metaphor, monitoring kundalini in dreams, symbol, symbolism, volcano, volcano eruption, volcanoes, working with dreams, working with kundalini energy. Bookmark the permalink.